Nearly everything relies on science. Having been the main vehicle of social change in the west, science deserves the special epistemic status that it acquired in the scientific revolution. By special epistemic status, I mean that science stands privileged as a way of knowing. Few but nihilists, new-agers, and postmodernist diehards would disagree. That settled, many are surprised by claims that there is not really a scientific method, despite what you learned in 6th grade. A recent New York Times piece by James Blachowicz on the absence of a specific scientific method raised the ire of scientists, Forbes science writer Ethan Siegel (Yes, New York Times, There Is A Scientific Method), and a cadre of Star Trek groupies. Siegel ties science’s special status to the scientific method. To defend its status, Siegel argues “[t]he point of Galileo’s is another deep illustration of how science actually works.” He praises Galileo for idealizing a worldly situation to formulate a theory of falling bodies, but doesn’t explain any associated scientific method. Galileo’s pioneering work on mechanics of solids and kinematics in Two New Sciences secured his place as the father of modern physics. But there’s more to the story of Galileo if we’re to claim that he shows exactly how science is special. A scholar of Siegel’s caliber almost certainly knows other facts about Galileo relevant to this discussion – facts that do damage to Siegel’s argument – yet he withheld them. Interestingly, Galileo used this ploy too. Arguing without addressing known counter-evidence is something that science, in theory, shouldn’t tolerate. Yet many modern scientists do it – for political or ideological reasons, or to secure wealth and status. Just like Galileo did. The parallel between Siegel’s tactics and Galileo’s approach in his support of Copernican world view is ironic. In using Galileo as an exemplar of scientific method, Siegel failed to mention that Galileo failed to mention significant problems with the Copernican model – problems that Galileo knew well. In his support of a sun-centered astronomical model, Galileo faced hurdles. Copernicus’s model said that the sun was motionless and that the planets revolved around it in circular orbits with constant speed. The ancient Ptolemaic model, endorsed by the church, put earth at the center. Despite obvious disagreement with observational evidence (the retrograde motions of outer planets), Ptolemy faced no serious challenges in nearly 2000 years. To explain the inconsistencies with observation, Ptolemy’s model included layers of epicycles, which had planets moving in small circles around points on circular orbits around the sun. Copernicus thought his model would get rid of the epicycles; but it didn’t. So the Copernican model took on its own epicycles to fit astronomical data. Let’s stop here and look at method. Copernicus (~1540) didn’t derive his theory from any new observations but from an ancient speculation by Aristarchus (~250 BC). Everything available to Copernicus had been around for a thousand years. His theory couldn’t be tested in any serious way. It was wrong about circular orbits and uniform planet speed. It still needed epicycles, and gave no better predictions than the existing Ptolemaic model. Copernicus acted simply on faith, or maybe he thought his model simpler or more beautiful. In any case, it’s hard to see that Copernicus, or his follower, Galileo, applied much method or had much scientific basis for their belief. In Galileo’s early writings on the topic, he gave no new evidence for a moving earth and no new disconfirming evidence for a moving sun. Galileo praised Copernicus for advancing the theory in spite of its being inconsistent with observations. You can call Copernicus’s faith aspirational as opposed to religious faith; but it is hard to reconcile this quality with any popular account of scientific method. Yet it seems likely that faith, dogged adherence to a contrarian hunch, or something similar was exactly what was needed to advance science at that moment in history. Needed, yes, but hard to reconcile with any scientific method and hard to distance from the persuasive tools used by poets, priests and politicians. In Dialogue Concerning the Two Chief World Systems, Galileo sets up a false choice between Copernicanism and Ptolemaic astronomy (the two world systems). The main arguments against Copernicanism were the lack of parallax in observations of stars and the absence of lateral displacement of a falling body from its drop point. Galileo guessed correctly on the first point; we don’t see parallax because stars are just too far away. On the latter point he (actually his character Salviati) gave a complex but nonsensical explanation. Galileo did, by this time, have new evidence. 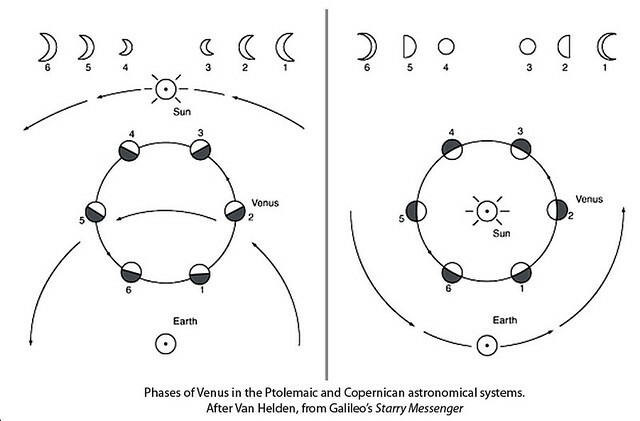 Venus shows a full set of phases, a fact that strongly contradicts Ptolemaic astronomy. But Ptolemaic astronomy was a weak opponent compared to the third world system (4th if we count Aristotle’s), the Tychonic system, which Galileo knew all too well. Tycho Brahe’s model solved the parallax problem, the falling body problem, and the phases of Venus. For Tycho, the earth holds still, the sun revolves around it, Mercury and Venus orbit the sun, and the distant planets orbit both the sun and the earth. Based on available facts at the time, Tycho’s model was most scientific – observational indistinguishable from Galileo’s model but without its flaws. In addition to dodging Tycho, Galileo also ignored Kepler’s letters to him. Kepler had shown that orbits were not circular but elliptical, and that planets’ speeds varied during their orbits; but Galileo remained an orthodox Copernican all his life. As historian John Heilbron notes in Galileo, “Galileo could stick to an attractive theory in the face of overwhelming experimental refutation,” leaving modern readers to wonder whether Galileo was a quack or merely dishonest. Some of each, perhaps, and the father of modern physics. But can we fit his withholding evidence, mocking opponents, and baffling with bizzarria into a scientific method? Nevertheless, Galileo was right about the sun-centered system, despite the counter-evidence; and we’re tempted to say he knew he was right. This isn’t easy to defend given that Galileo also fudged his data on pendulum periods, gave dishonest arguments on comet orbits, and wrote horoscopes even when not paid to do so. This brings up the thorny matter of theory choice in science. A dispute between competing scientific theories can rarely be resolved by evidence, experimentation, and deductive reasoning. All theories are under-determined by data. Within science, common criteria for theory choice are accuracy, consistency, scope, simplicity, and explanatory power. These are good values by which to test theories; but they compete with one another. Galileo likely defended heliocentrism with such gusto because he found it simpler than the Tychonic system. That works only if you value simplicity above consistency and accuracy. And the desire for simplicity might be, to use Galileo’s words, just a metaphysical urge. If we promote simplicity to the top of the theory-choice criteria list, evolution, genetics and stellar nucleosynthesis would not fare well. Whatever method you examine in a list of any proposed family of scientific methods will not be consistent with the way science has made progress. Competition between theories is how science advances; and it’s untidy, entailing polemical and persuasive tactics. Historian Paul Feyerabend argues that any conceivable set of rules, if followed, would have prevented at least one great scientific breakthrough. That is, if method is the distinguishing feature of science as Siegel says, it’s going to be tough to find a set of methods that let evolution, cosmology, and botany in while keeping astrology, cold fusion and parapsychology out. This doesn’t justify epistemic relativism or mean that science isn’t special; but it does make the concept of scientific method extremely messy. About all we can say about method is that the history of science reveals that its most accomplished practitioners aimed to be methodical but did not agree on a particular method. Looking at their work, we see different combinations of experimentation, induction, deduction and creativity as required by the theories they pursued. But that isn’t much of a definition of scientific method, which is probably why Siegel, for example, in hailing scientific method, fails to identify one. [edit 8/4/16] For another take on this story, see “Getting Kepler Wrong” at The Renaissance Mathematicus. Also, Psybertron Asks (“More on the Myths of Science”) takes me to task for granting science special epistemic status from authority. This entry was posted on August 1, 2016, 8:38 pm and is filed under History of Science, Philosophy of Science. You can follow any responses to this entry through RSS 2.0. You can leave a response, or trackback from your own site. Coming up with a theory that fits the data better is certainly a step in both the scientific method and science. This is especially true if the new model makes more sense than the old one. The scientific method has evolved since then and model and model verification require far more data than before. There are of course many exception today where papers are published with cherry picked data, bad statistics, and outright cheating. Also experiments should be repeated by other qualified people and experiments that failed should be published. This is often true in the social and biological sciences but does happen in the hard sciences as well. It’s not perfect but like democracy it work better than any other system. Agree, but I’m still not sure I can nail down A method. I’m not saying we need to do so. Others insist there is one such method, and thus we can know exactly when we’re adhering to it. I didn’t intend to comment anonymously, my comment posted itself whilst I was still filling in the mask! Thanks for that. Good read. Great post. There’s also the issue of dealing with apparently anomalous results. Are they falsifying or simply an anomaly? Often, it’s not immediately clear and it may take years to figure out what the results actually mean for the theory under consideration.